"Talking about the show reminds you of things that you went through. So it's fun. When the show was on, I couldn't have handled it. I didn't want that direct connection." 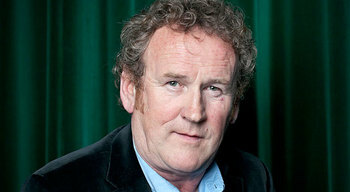 Colm J. Meaney (born May 30, 1953) is an Irish actor likely well-known for his work as Star Trek character Miles O'Brien, first as a recurring character on Star Trek: The Next Generation that grew more prominent as time went on, and later as an official main character on Star Trek: Deep Space Nine. Ascended Extra: O'Brien was originally a background actor with some lines on TNG but he kept coming back and became a more and more prominent recurring character until becoming a full-blown series regular aboard DS9. Captain Ersatz: A very strange example in that he played the father of the family in all three adaptations of Roddy Doyle's Barrytown Trilogy. Due to licensing issues, the characters from The Commitments were not allowed to be used for The Snapper, so the family was changed. The same thing happened again for The Van, making his character in that film a Captain Ersatz of a Captain Ersatz. Typecasting: In part due to his Irish heritage, he's appeared in a lot of British flicks like Layer Cake and The Damned United. His Irish heritage also guarantees him bit parts in films about historic New York like Far and Away, among others.